One of my favorite dies are these Spellbinder's "Pears" just love them... On the Card Maker blog there is a challenge to use dry embossing and highlight some of it... right up my alley. So I'm using my newest acquisition - Cuttlebug, Anna Griffin "Brocade" is a gorgeous embossing folder set. I'm using the background folder for this card. I side folded my white card (4.25"w x 5.5"h). I made a diffuser a while back which I keep handy made from mat board that gives me a 1" border around this size card. So I placed my card front in the folder, put my diffuser on top, matching the edge of my card and then my embossing sandwich and thru my machine. Used my Scor-It board to create a definite border line between the embossing and my center rectangle. Stamped the sentiment (Quietfire Design) using Versafine Black Onyx and clear embossed. Die cut the pears and used the same embossing folder. The larger pear has a light sponge application of Distress "Scattered Straw" and then some "Aged Mahogany", Then I used the Mahogany pad to hit the high points. The smaller pear has the scattered straw and then "Crushed Olive" and then the pad of Olive on the high points. Clear embossed them then adhered them to the card with white Alene's glue. The leaves are another Spellbinder die "Foliage". They were left plane and just sponged with the same colors and then cut away from the multi leafed die cut. Gorgeous! I love the texture and the rich colors you used for the pears. Thanks for playing in Squigglefly's challenge! Love all the texture and beautiful Fall colors. So glad you played along with the One-Layer Wednesday Challenge this week. What a fab take on our Sweet Treats challenge. 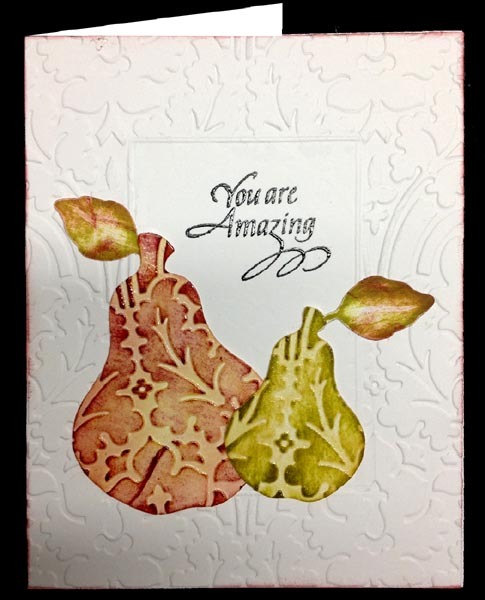 I love the embossing and your pears look delicious. Beautiful card. Love the embossed pears. Thank you for joining us this week at Fab'n'Funky! CAS and Super Striking! Great design! Thanks so much for joining us at Flourishes!